The reputation of the missionary and explorer Louis Hennepin is very bad indeed. A companion and protégé of Robert Cavelier de La Salle, who despised the Jesuits and surrounded himself with the Récollets, Hennepin followed the explorer from 1676 to 1680. He was not highly thought of in the colony where he lived for a few months at the beginning and end of his sojourn, but he painted a portrait of himself as a daring and courageous missionary. An exceptional promoter of the territories of North America in Europe, he lied in describing himself as La Salle’s equal in the 1678 expedition to the Baie des Puants (Green Bay). Worse still, after the death of his leader, he actually claimed to have discovered the mouth of the Mississippi two years before La Salle. By claiming for himself a merit that is still disputed to this day, the author of the first description of Niagara Falls threw discredit on his own contributions to the exploration of North America. Plunged back into the ” regulations of pure and severe virtue “, he travelled in Holland where he was caught in the midst of the Franco-Dutch war that began in 1672. As chaplain among the injured and ill soldiers, he showed true devotion. At the battle of August 11, 1674 in Seneffe, Belgium, he encountered Daniel Greysolon Dulhut who would come to his rescue in July 1680. In 1675, there was no shortage of new lands to discover. Designated by his superiors along with four of his fellow priests for missions in New France, Hennepin arrived in Quebec City on June 16. The journey enabled him to meet Monseigneur de Laval and Robert Cavelier de La Salle who was returning from Versailles with titles of nobility and full ownership of the fort and the seigneurie of Cataracoui created for him. We don’t know at exactly what moment the alliance between the missionary and La Salle the explorer was sealed, but it seems it was already settled that Hennepin would be part of the next expedition. While awaiting adventure, he performed his religious duties in the posts and missions of the North Shore, from Pointe-Claire (Montreal) to Cap-Tourmente (Beaupré). In early spring 1676, Hennepin was sent to Fort Cataracoui, renamed Frontenac in honour of the governor. There he built a chapel and a residence for the missionaries. Two years later, he was back in Quebec City. He met Cavelier de La Salle, back from France in September 1678 with the authorization to further explore as far as Florida and New Mexico. The explorer had also obtained permission for Hennepin and two of his colleagues to come along and perform their duties in the wake of the discoveries. Things were going badly at Fort Crèvecoeur, built in January 1680, on the site of the present-day city of Peoria, Illinois. Workers and coureurs des bois had deserted, food was scarce and they were lacking the necessary materials for navigation. This was the context in which Cavelier de La Salle decided to return to Niagara. 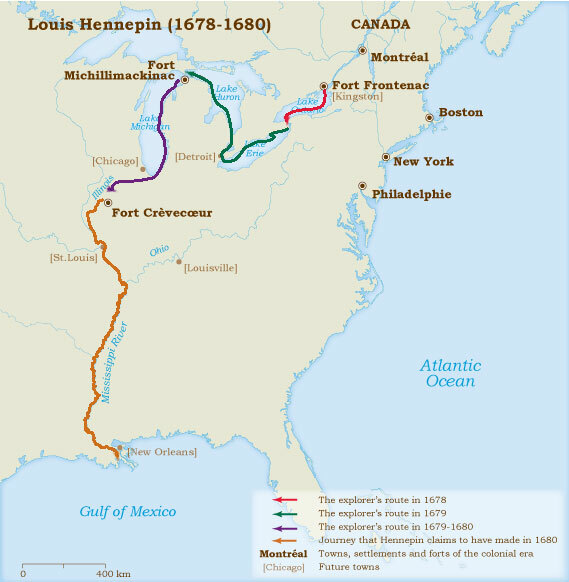 Hennepin apparently refused to give up, and even proposed to set out ahead on the Mississippi : “In this extreme situation, we both took a decision that was both extraordinary and difficult: myself to head out with two men into unknown territory, and La Salle to return on foot to Fort Frontenac, more than five hundred leagues away.” The two men would never see each other again. If the missionary’s tale is to be believed, between February 29 and March 10, the three men affronted the ice and travelled down the Illinois River as far as the Mississippi. From there, remounting the tumultuous river, they passed present-day Minneapolis where a waterfall was named St. Anthony Falls. Advancing toward the north and west of Lake Superior, the three men reached Lac des Issatis (Leech Lake), source of the Mississippi River. Again according to the 1683 story, Hennepin and his companions then returned toward Fort Crèvecoeur. They were still a good distance from the mouth of the Illinois when, in the early afternoon of April 11, 1680, they were captured by the Sioux who took them toward the Mille Lacs region, south of Lake Superior. Adopted by the village chief, the three men were confined there. On July 25 Daniel Greysolon Dulhut,who had negotiated the alliance of the French and the Western tribes against the Iroquois, came to demand the liberation of Hennepin, Accault and Auguel, who were only freed in September. After wintering in Michillimakinac, Dulhut and Hennepin returned to the colony. Curiously, the missionary, who then travelled from Montreal to Quebec City with Frontenac, told him of his expedition, but kept silent on the details of his purported voyage toward the south of the Mississippi and the Gulf of Mexico. He maintained the same silence with Monseigneur de Laval. On his return to France at the end of 1681, Hennepin began writing his first book. His Description de la Louisiane […] is inspired by the tales of one of his colleagues, who took part in Cavelier de La Salle’s possession of Louisiana on April 9, 1682. Dedicated to Louis XIV, the work was an enormous success. It was translated and re-edited in its original form on three occasions. Louis Hennepin published his third work in 1698. Nouveau Voyage d’un Pais plus grand que l’Europe […] reaffirmed his contribution to the discovery of North America. The missionary/author was then an undesirable subject in his own community. Due to circumstances and his thirst for fame, he had been a subject of both France and England. He was authorized to return to France in 1698, but on May 27, 1699, Louis XIV ordered that he be arrested if he ever attempted to return to New France. Louis Hennepin died after 1705 and it is not known whether he was still a Récollet priest.